Do video games influence the teacher-student relationship? Do video games show impact on our relationships? 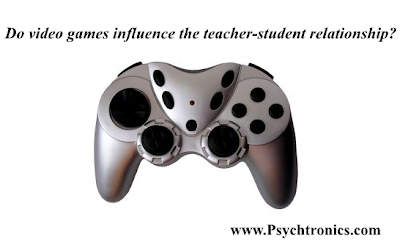 Relationships: Do video games influence the teacher-student relationship? A recent study hints at the possibility. This study compared mothers playing with their toddlers with traditional toys versus electronic versions of the same toy. Mothers playing with the electronic toys were less responsive, less likely to be educational, and less encouraging. Might the same apply to teachers and students? Could video games, because they “do the teaching” have a negative impact on a teacher’s ability and motivation to engage with students? Could video games disempower teachers? Motivation: We use incentives all the time to motivate learning (e.g., grades), but video games may be unique in the degree to which incentives, whether points or rewards, are integral to the learning process. If the motivation for learning becomes too closely tied to these external incentives, the pleasure of learning for learning’s sake may be squelched and children may miss opportunities to appreciate that setbacks—not getting a reward—are opportunities to improve. We must think through the subtle ways in which video games can shape children’s motivation for learning and design video games to encourage the learning style we believe will be most productive.